The planning process really begins once the political will is in place and the feasibility report has been accepted — this is the point at which the system is ready to be designed and constructed. Or that is the case in an ideal world. In reality, the planning was probably done first, then adjusted to meet political and financial criteria, and then hopefully tweaked at the end to take user preferences and other core concepts into account. Whatever the case, this chapter and the following one suggest a path towards strategically planning a user-oriented system that can be expanded and has a great probability of success. 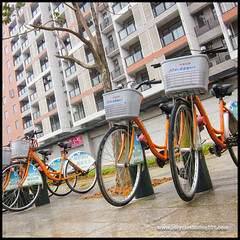 The photographs and figures below illustrate some of the aspects of the ‘System Planning’ chapter in the book Bicycle Sharing 101: Getting the Wheels Turning. They are meant to be viewed in the context of reading that chapter. 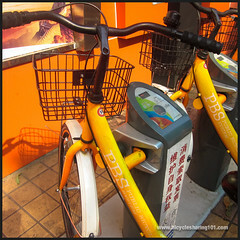 ABOVE: London’s Barclays Cycle Hire uses a separate key, rather than being part of the Oyster system whose single card gives access to most of the city’s other transit systems, while China’s Hangzhou uses a single card for all transport options, including a water taxi. ABOVE: This Barclays Cycle Hire terminal, set at a station on a quiet, cycling-friendly road, offers the potential first-time user the opportunity to spontaneously sign up, use a credit card to pay and ride away immediately. ABOVE: The style and subject matter of this Barclays sign indicates that it is not just aimed at the elite in London society. 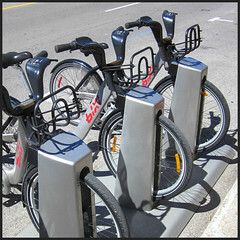 ABOVE: A Bixi terminal in Montreal becomes the target for unauthorized public art. 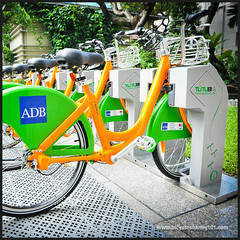 ABOVE: Clear educational material on the bike not only helps to prevent accidents, but would also presumably absolve the system of liability in certain eventualities. 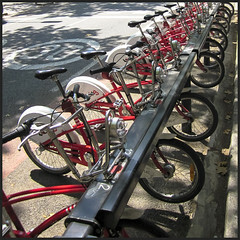 ABOVE: In Melbourne, where helmets are required by law, users can purchase one by credit card from a vending machine nearby. 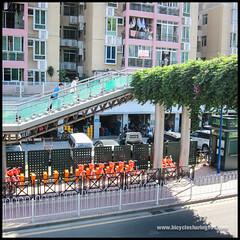 ABOVE: Integrated signage and/or transport maps seen in Osaka, Japan, and Guangzhou, China.